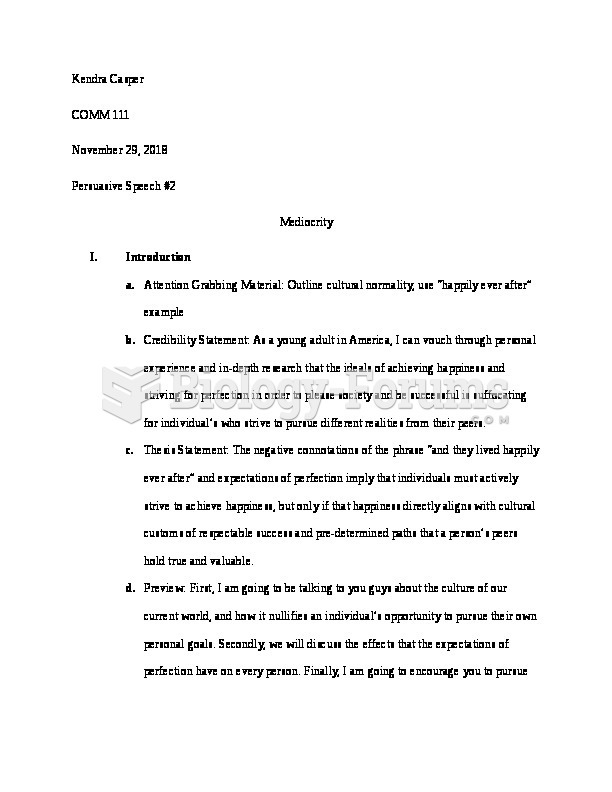 Kendra Casper COMM 111 November 29, 2018 Persuasive Speech #2 Mediocrity Introduction Attention Grabbing Material: Outline cultural normality, use “happily ever after” example Credibility Statement: As a young adult in America, I can vouch through personal experience and in-depth research that the ideals of achieving happiness and striving for perfection in order to please society and be successful is suffocating for individual’s who strive to pursue different realities from their peers. Thesis Statement: The negative connotations of the phrase “and they lived happily ever after” and expectations of perfection imply that individuals must actively strive to achieve happiness, but only if that happiness directly aligns with cultural customs of respectable success and pre-determined paths that a person’s peers hold true and valuable. Preview: First, I am going to be talking to you guys about the culture of our current world, and how it nullifies an individual’s opportunity to pursue their own personal goals. Secondly, we will discuss the effects that the expectations of perfection have on every person. Finally, I am going to encourage you to pursue your own personal ideals of happiness, regardless of what society has to say about it. Body Main Point 1: Culture nullifies an individual’s opportunities to try new skills Believes happiness is defined by how good people are at what they do Discuss Tim Wu’s essay “In Praise of Mediocrity” Main Point 2: Effects of the Expectations of Perfection People begin to give up on their dreams Michael Phelps story Main Point 3: What am I saying? It’s ok to fall! Joy can be found in the learning process; embrace it Encourage others and yourself to pursue your dreams and passions, even if your peers are not supportive of your passions Conclusion Summary Statement/ Wrap-Up: I talked to you all today about the culture in our current society, the importance of remembering to pursue individual happiness, the negative connotations that result from expecting perfection, and the fact that failing is part of the learning process and part of achieving genuine and individual happiness. Mediocrity is a beautiful concept, as it allows for us to be satisfied and achieve our own personal happiness without being pressured to gain the admiration and respect of our peers. Concluding Remarks/ Takeaway: Actively searching for happiness in a society so full of judgement and expectations is a black hole and eliminates all freedom and opportunity from your life. Excellence should not be considered a trait that will help a person to live “happily ever after.” Instead, the opportunity to be simply mediocre and free to make decisions based upon your own personal passions will allow us as a society to discover our own versions of happiness when we least expect it. Works Cited Wu, Tim. “In Praise of Mediocrity.” The New York Times. September 30, 2018. Scutti, Susan. “Michael Phelps: 'I Am Extremely Thankful That I Did Not Take My Life'.” CNN, Cable News Network, 20 Jan. 2018. “An Essay on Mediocrity.” Www.inside-Politics.org, 21 May 2012, inside- politics.org/2012/05/21/an-essay-on-mediocrity/.